This notebook explains how to estimate the CTA sensitivity for a point-like IRF at a fixed zenith angle and fixed offset using the full containement IRFs distributed for the CTA 1DC. The significativity is computed for a 1D analysis (On-OFF regions) and the LiMa formula. We use here an approximate approach with an energy dependent integration radius to take into account the variation of the PSF. We will first determine the 1D IRFs including a containment correction. Here we assume a source at 0.7 degree from pointing position. We perform a simple energy independent extraction for now with a radius of 0.1 degree. We extract the 1D IRFs from the full 3D IRFs provided by CTA. Here we will determine an integration radius that varies with the energy to ensure a constant fraction of flux enclosure (e.g. 68%). We then apply the fraction to the effective area table. By doing so we implicitly assume that energy dispersion has a neglible effect. This should be valid for large enough energy reco bins as long as the bias in the energy estimation is close to zero. We now provide a workaround to estimate the background from the tabulated IRF in the energy bins we consider. We impose a minimal number of expected signal counts of 5 per bin and a minimal significance of 3 per bin. We assume an alpha of 0.2 (ratio between ON and OFF area). We then run the sensitivity estimator. The results are given as an Astropy table. A column criterion allows to distinguish bins where the significance is limited by the signal statistical significance from bins where the sensitivity is limited by the number of signal counts. This is visible in the plot below. 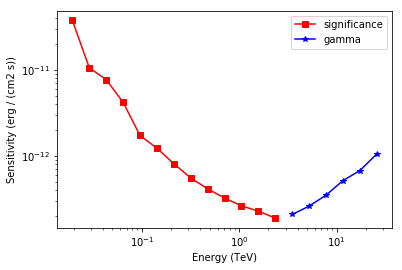 is_s = t["criterion"] == "significance"
is_g = t["criterion"] == "gamma"
t["energy"][is_g], t["e2dnde"][is_g], "*-", color="blue", label="gamma"
We add some control plots showing the expected number of background counts per bin and the ON region size cut (here the 68% containment radius of the PSF). 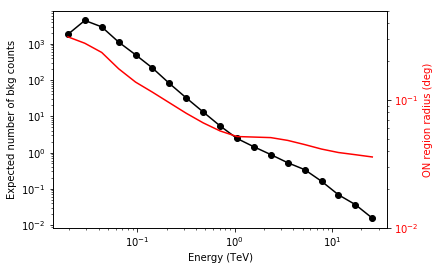 t["energy"], t["background"], "o-", color="black", label="blackground"
Compare how the sensitivity differs between 5 and 20 hours by plotting the ratio as a function of energy.